Langue du rapport d'étude de cas : Anglais (Cliquez sur EN dans le menu des langues). Within the framework of the DCA project NIMk/LIMA has digitised over 500 artworks made between 1993 and 2005, including additional video artworks from media art pioneers from the Netherlands such as Nan Hoover, Servie Janssen and Stansfield/Hooykaas. Next to this, 1,500 media artworks from the collection have been made accessible online. 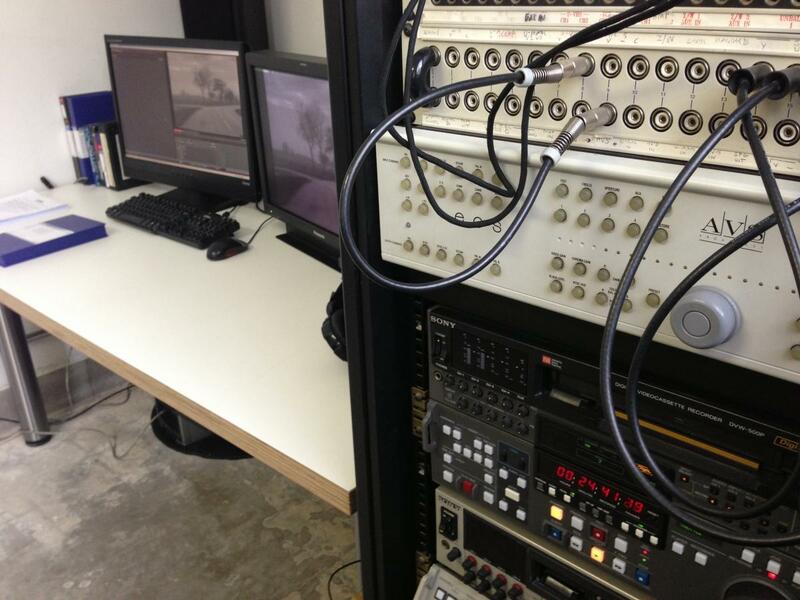 The main goals for the digitisation of the video artworks are preservation and access. 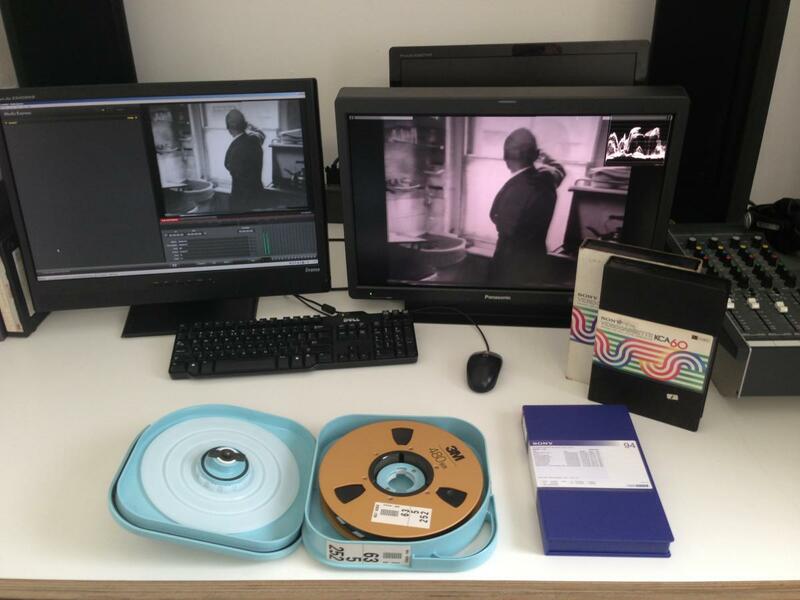 In this case study the digitisation for preservation and online access of video artworks on U-matic by the art collective Stansfield/Hooykaas is highlighted. How to make sustainable digital reproductions of the artists’ videos while maintaining their significant properties in the digital form? How to make the digital reproductions accessible online in order to create an experience that can be considered the digital equivalent of the analogue experience? This case study describes how the institution dealt with these challenges. The Foundation LIMA was established in 2012 by experts from the Netherlands Media Art Institute (NIMk, discontinued as of 1 January 2013) dedicated to providing continued, long-term access to works of media art. With active, online distribution of its own collection, a shared service structure for the storage and conservation of media art collections and a lab devoted to the permanent preservation of such works for producers and museums all over the world, LIMA is striving toward sustainable access to media art. NIMk/LIMA is an international expertise institute in preservation and digitisation of media art. NIMk and it’s successor, LIMA, provide digitisation and preservation services and permanent digital storage for media artworks by more than five hundred artists, including Marina Abramovic, the Vasulkas, Nan Hoover, Stansfield/Hooykaas, Servaas and Jan Fabre, and for more than fifteen collections, including those of the Kröller-Müller Museum, the Van Abbe Museum, and the Netherlands Cultural Heritage Agency (RCE). NIMk carried out all digitisation in-house. Over the preceding decades Montevideo, Time Based Arts and the Netherlands Media Art Institute carefully assembled an extensive distribution collection. It ranges from the first experiments in the field of media art from the 1970s to recent productions by famous Dutch and international artists, and rising new talent. The collection provides a rich survey of international video art, media art installations, born-digital art and performances. LIMA has committed itself to the task of maintaining and expanding this collection and the accompanying archive. LIMA currently holds the largest and most complete collection of video artworks by the Scottish-Dutch artist collective Stansfield/Hooykaas. Madelon Hooykaas and Elsa Stansfield began their collaboration in 1972. Madelon Hooykaas was born in the Netherlands, Elsa Stansfield in Scotland. Both first operated together under the name White Bird, later changed to Stansfield/Hooykaas. Their first film was broadcast on Dutch television in 1973. Under the name Stansfield/Hooykaas the artist collective produced their first video installations from 1975 onwards and acquired fame as European video pioneers. During their 32-year partnership they produced a body of around 150 works. Their work deals with the relation between nature and spirituality, and explores scientific principles and natural forces such as radio waves and magnetic fields. Hooykaas and Stansfield make use of contemporary technology such as film, audio and video in combination with organic materials such as sand, glass and copper. In their work they show that movement and change animate everything that exists. Work by Stansfield/Hooykaas has been acquired by various international museums, and in the Netherlands it was awarded the Judith Leyster Prize in 1996. The installations and films of Hooykaas/Stansfield have been exhibited in many venues, for instance in Montreal, Sydney (Biennale), Chicago, Madrid, Reykjavik, Kassel (documenta), the Museum of Modern Art in New York (MoMA), Stedelijk Museum Amsterdam, Bremen, Hannover, Berlin, Sheffield, Washington D.C., Lucerne, London (Whitechapel Gallery), Toronto, Hong Kong, Helsinki, Tokyo, Stockholm, Den Haag (Gemeentemuseum), Dundee and Hafnarfjordur. At the Film Festival in Split, Croatia in 1999 they were awarded the Grand Prix for New Media for Person to Person (CD-ROM). In 2004 Elsa Stansfield died unexpectedly. In the years that followed Madelon Hooykaas produced various video installations and audio works, both under the name Stansfield/Hooykaas and her own name. Some time after the death of Elsa Stansfield, Madelon Hooykaas wished to evaluate and sort out all the documents, audiovisual elements and objects in her possession that are connected to the Stansfield/Hooykaas (S/H) oeuvre. The project embraced the evaluation, inventory and indexing of the S/H archive; the entire body of work of the artist collective from 1972 until 2005. An exhaustive list and report of S/H works and related documents was made. The S/H archive consists of a variety of audiovisual material including 8 and 16mm films (approximately 40 elements), magnetic audiotapes and videotapes in various carriers and formats (approx. 400 tapes). It also comprises a considerable amount of paper documents such as scripts, project proposals, contracts, drafts, notes, correspondence with galleries, museums and other cultural and funding institutions, budget calculations, circuit drawings, clippings and so on. Next to them stand negatives, contact sheets, photographs and slides that either document exhibitions and short duration presentations, or are actual parts of them. The majority of the paper-based documents and some of the photographic material were stored in folders named after exhibitions and/or geographical places, works, years or themes. The videotapes were located in a cupboard especially reserved for them. They were ordered by carrier – U-matic, VHS, open reel tapes, audiotapes etcetera- and by system: PAL or NTSC. The PAL U-matic tapes were placed in chronological order where the size of the tape and cupboard height permitted it. The films stood next to the tapes or in boxes in the corridor outside Elsa Stansfield’s studio. The majority of the photographic material was placed in a cupboard especially reserved for it. The installation components were either in a storage space in Drenthe or in the basement of the studio of Madelon Hooykaas. registrations of installations and exhibitions. 43 of those 90 works of art were part of the collection of the Netherlands Media Art Institute (referred to as NIMk/LIMA from here on) or other Dutch cultural organisations such as de Appel and the Stedelijk Museum in Amsterdam, and the Institute of Cultural Heritage Agency (RCE). The works that are part of the aforementioned collections have been preserved on Digital Betacam. The rest of the Stansfield/Hooykaas videotapes (47) are not part of specific collections in the Netherlands and are not preserved yet. Together with Madelon Hooykaas, NIMk/LIMA made from this list a selection of 22 not yet preserved keyworks; including all of the oldest works and the complete series From the Museum of Memory to be preserved. The works were added to the NIMk/LIMA collection and preservation of these 22 works took place as part of the DCA project. The majority of the tapes were on U-matic format. From 1981 onwards, all the works are in colour. All formal metadata (title, year, length etc.) and most of the technical and contextual metadata is inserted into the NIMk/LIMA Collection Information System, including technical specifications of the master tape or master file. The metadata scheme is inspired by Dublin Core. All 43 video artworks are digitised, resulting in uncompressed AVI files stored on LTO 5 tapes, and lower resolution copies in MPEG-2 and MPEG-4 formats stored on the internal Linux (Ubuntu) Server with an 8 TB storage capacity. Video fragments and stills are made automatically and stored on the same server. Links to all media are made, and the content is published online at LIMA Online Catalogue. The main goal for the digitisation of Stansfield/Hooykaas video artworks is to maintain sustainable access to the work. Next to the emphasis on digital sustainability it is now a priority to make the works more widely accessible. The most important motive for this is the potential created by digitisation and the Internet, which offers new models of presentation, distribution and collection alike, and allows the possibility of reaching a worldwide audience. The first three steps were already taken before the DCA project started in January 2011. NIMk decided that the video artworks would be digitised in accordance with high quality standards for sustainable digital preservation. This would also allow high-quality access and the possibility for the files to be used for diverse purposes. The digitisation budget was also already defined during the preparation phase. Copyright clearance was not a big issue since the NIMk collaborated with Madelon Hooykaas, the heir of the collective. The artist holds the copyrights on the digital reproductions. NIMk stores, publishes and distributes the works. The first part of the digitisation process begins with the important work of cleaning the tapes themselves. This is done using industry standard RTI machines; in the case of U-matic tapes the RTI VT3100 machine is used. LIMA is one of the few places in the Netherlands operating one of these rare machines. The VT3100 uses a dual-cleaning and error reporting system. It simultaneously cleans both sides of the magnetic tape, and scans it to produce information about any potential defects in the audio, video, and control tracks. In the case of tapes that have been damaged or stored in non-optimised environments, repeated cleaning cycles may be necessary. Ensuring that the tape is of the best possible physical quality before preservation is critical to obtaining a high-quality result, and also protects the U-matic player from the risk of damage or transferring dirt to the head units during playback. 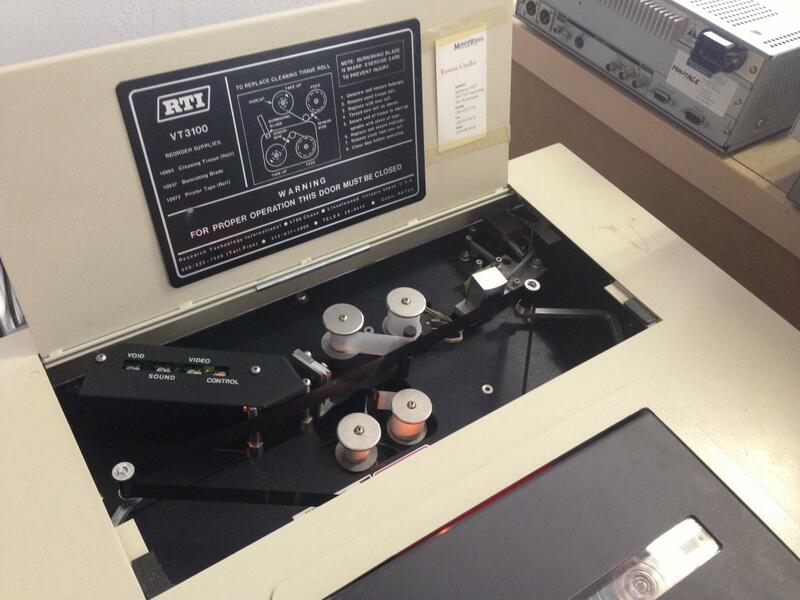 When the tape is ready for playback, it is loaded into one of our U-matic decks. The machine to be used is selected according to the tape format. LIMA has the capability to play all U-matic formats, including Low-Band, High-Band and SP, in both PAL and NTSC standards. A composite video signal is routed from the U-matic player through an AVS EOS video standards converter and time base corrector (TBC). This allows re-calibration of the video signal, including adjustment of video gain and black levels, and chroma retiming. This adjustment is done using both the colour bars at the start of a tape as a reference standard, and from various randomly selected parts of the artwork itself. Calibration is done using industry-standard Tectronic vectorscope and waveform monitors, and an audio peak level meter. The video signal is output from the TBC via a component signal to a Sony BVW-500 Digital Betacam deck, which acts as a high quality A-D (analogue to digital) signal converter. The audio signal from the U-matic deck is handled in a similar way. Analogue stereo signals are sent first to an Eela mixing console to be balanced and routed, before being sent to a Bell audio delay interface. This is an important part of the process, because using the TBC to recalibrate and stabilise the video introduces a latency of one frame into the video signal. This means that the video passing through the TBC is delayed by one frame, and thus the Bell unit is required to delay the audio by one frame in order to resync the audio and video signals from the tape. 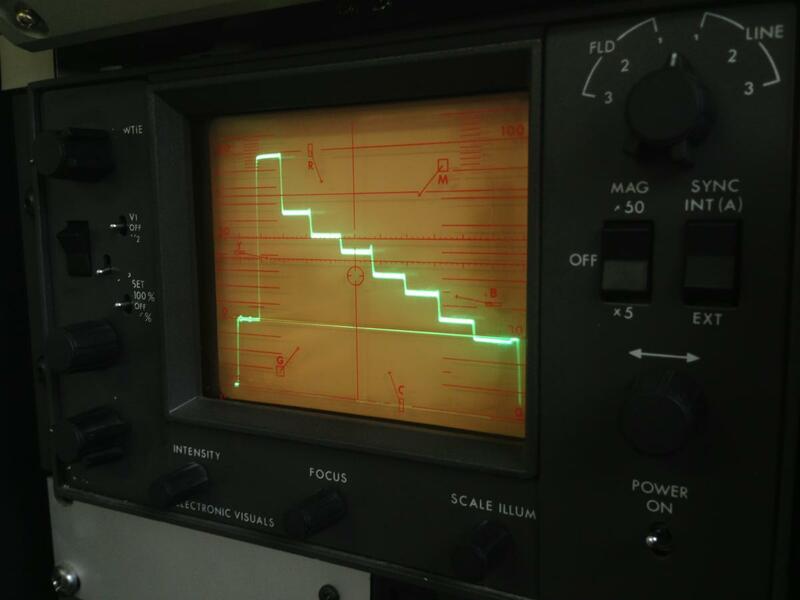 From the Bell unit, AES/EBU digital audio is fed to the BVW-500, where it is rematched to the video signal. A digital SDI stream containing both audio and video information is then sent from the BVW-500 deck to NIMk/LIMA’s computer capture station, utilising a Blackmagic Multibridge Pro card and Blackmagic Media Express software to capture 10-bit uncompressed AVI files. This workflow represents the main processes involved with digitisation of analogue video material. LIMA advocates and uses open source software, and understands the importance of open formats and codecs for long-term preservation. Especially in the digitisation of audiovisual material the choice of the format and the codec is always a trade-off. The BlackMagicDesign MultiBridge hardware that we use for digitalisation writes the files in an AVI format with a V210 codec. Although this is a proprietary codec, we have selected it because it is a well-known and current codec, supported by most of the coding- and editing software. We monitor the evolution of the support of the codec, in order to be able to anticipate the possible need of transcoding. After the capturing, we select random sample files for quality control. These are visually checked at the start, middle, end and/or at length. If the results of this inspection are OK, the files have been successfully captured. When high-quality uncompressed AVI files have been successfully captured, the files are renamed using NIMk/LIMA’s mySQL catalogue database, and any additional metadata relevant to the work is recorded. At this point, MD5 hash files are created for the video files, and they are transferred to our remote server for writing to LTO tape for storage. At each point of transfer, the MD5 files are re-checked to ensure data integrity. As part of the established workflow at LIMA, the uncompressed AVI master files are then used as the source to create MPEG-2 video files to be used as distribution/exhibition versions. This is done using high-end Snell and Wilcox hardware, which offers unprecedented quality in terms of MPEG-2 encoding. 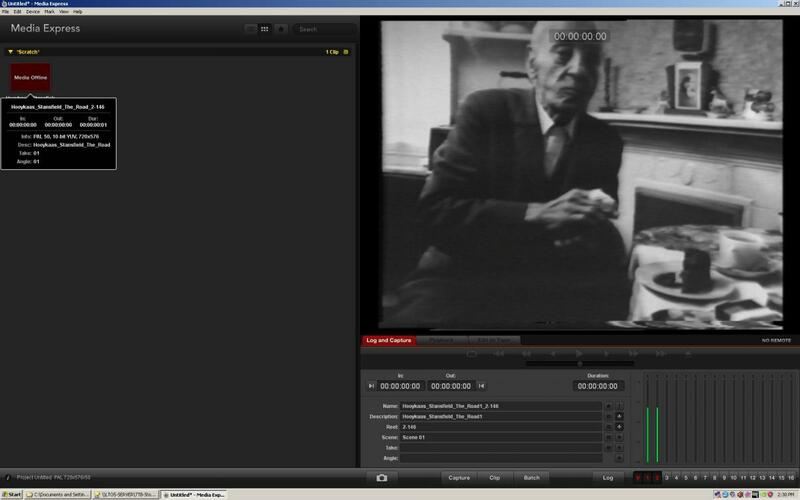 At this stage, noise reduction filters can be implemented as required to improve the aesthetic quality of the video for screening purposes, and if necessary a black border ‘mask’ can also be superimposed over the video signal to obscure the overscan sections of the image around the edge of the frame. This ‘overscan’ - a flickering line along the top and bottom of the image - was never seen on the CRT monitors for which the work was originally produced, but is clearly visible on newer flatscreen monitors. The result can be visually disturbing, which is why we have designed and implemented a masking system to hide the overscan and ensure the work is viewed as originally intended. Naturally, this masking is only implemented on the distribution/exhibition versions of the work, never on the uncompressed AVI master files. The final stage of the process is creating the MPEG-4 versions of the work for online use. These files are generated automatically from the MPEG-2 files, and generally include a watermark. At this point, still images and 30 seconds fragments of the work are also automatically generated. All derivatives are linked to the database. Preparation and digitisation of the video artworks on U-matic took around 2.5 times the initial length of the works and was done over a two-month period, together with the Betacam format tapes. The digitisation team consisted of two people, Matt Kemp for digitisation and linking the files to the database and Wiel Seuskens for storage and digital data management. Together with Gaby Wijers and Ivo van Stiphout, the procedure and quality control was set up. Insertion of works into the database including keywords and content descriptions was made during a three-day period. Technical preservation metadata about the digitalisation source, digital artefacts a.o. are also stored in the collection’s information system. All videos are disclosed through the on-line platform LIMA. The system allows for the metadata to be harvested by OAI-PMH. LIMA uses its own metadata scheme, inspired by Dublin Core and keywords inspired by GAMA. Via GAMA, the works are harvested for Europeana. The archival preservation master collection on uncompressed AVI files, stored on two duplicate sets of LTO-5 tapes, one kept on location and one kept off-site as backup. The distribution collection (copies) in MPEG-2 format for exhibitions and screenings, and MPEG-4 for online presentations. The MPEGs are stored on HDD on location with one duplicated off-site backup copy. The result of digitisation was 22 AVI files, 22 MPEG2 files, 22 MPEG4 files, 22 fragments and 44 stills. - file format: AVI, V210 video codec, PCM audio. - file format: MPEG4, h.264 video codec, aac audio codec. - file format: TIFF, JPEG. - Ramon Coelho (NIMK) and Wiel Seuskens (NIMK), Onderzoek naar duurzame, compressieloze opslag van videokunst, NIMK, 2009, 16 p.
- Paulien'T Hoen (ed.) and Gaby Wijers (ed. ), Project Behoud Mediakunst Collectie Nederland, SBMK/NIMk, 33p. - Sofie Laier Henriksen (NIMk), Wiel Seuskens (NIMk) and Gaby Wijers (NIMk), D6.1 Guidelines for a Long-term Preservation Strategy for Digital Reproductions and Metadata, DCA, 2012, 76 p.
- Sofie Laier Henriksen (NIMk), Wiel Seuskens (NIMk) and Gaby Wijers (NIMk), D6.2 Best practices for a digital storage infrastructure for the long-term preservation of digital files, DCA, 2013, 51 p.
1) Journeys, 1976, 3 channel audio-video installation, 5 tapes, 11'14”, 11'14” and 7'28” minutes, b/w. Carriers: ½ inch open reel and U-matic. 2) The Road, 1976, single channel video installation, 15'00”, b/w. Carrier: U-matic. 3) Just Like That, 1977, single channel/2 monitors audio-video installation, 1 tape, 4'20”, b/w. Carrier: ½ inch open reel. There is also a Digital Betacam tape, this tape is preserved by NIMk/LIMA. 4) Memory Window, 1977, 3 channel audio-video installation and a closed circuit, 3 tapes, 20min.each, Carriers: ½ inch open reels. There is also a 31'00” compilation tape, this tape is preserved by NIMk/LIMA. 5) Generations, 1977, single channel audio-video, 1 tape, 22'41”, N.T.S.C., color. Carrier: U-matic. 7) Two Sides of a Story, 1981, 2 tapes, multiple channel / closed circuit audio-video installation. Carriers: U-matic. There is also a single channel version that is preserved. 9) Point of Orientation… From the Museum of Memory III, 1986, two channel audio-video installation. Videotape A and videotape B duration: approximately 15min. Carriers: U-matic. There is also a single channel version that has been preserved 14'41”. 10) From the Museum of Memory IV, 1986, two channel audio-video installation. Videotape A: Blue Book, 6min. / Videotape B: Yellow Book, 6min. Carriers: U-matic. 11) Phosphor…from the Museum of Memory V, 1987, single channel audio-video installation. Videotape duration: 7min. Carrier: U-matic. 13) From the Museum of Memory VII, 1988, single channel audio-video installation. Videotape duration: 7min. Carrier: U-matic. 15) Liquid Crystal, 1991, single channel video sculpture. Videotape duration: 21'37”. Carrier: U-matic. 16) True North, 1991-1992, video sculpture using one video tape. The duration of the videotape is 32'47”. Carrier: U-matic. 18) As Far as Japan, 1996, single channel video sculpture. Videotape duration: 10'20”. Carrier: U-matic SP. 19) Inside A Portrait, 1997, two channel video installation. Duration of each videotape: approximately 7min. Carriers: Digital Betacam. 21) Deep Looking, 2003, single channel video work, 30'00”. The work is part of the NIMk/LIMA collection but not preserved. Carrier: Digital Betacam. 22) Re:Vision, 2005, single channel video work 30'00. The work in part of the NIMk/LIMA collection but has not been preserved yet. Carrier: Digital Betacam.